We’ll see here how to open the same application used in the 3 previous articles with a JSON endpoint. This new endpoint will then be used by an HTML5 application thanks to jQuery that will help us calling the remote service and bring life to our page. 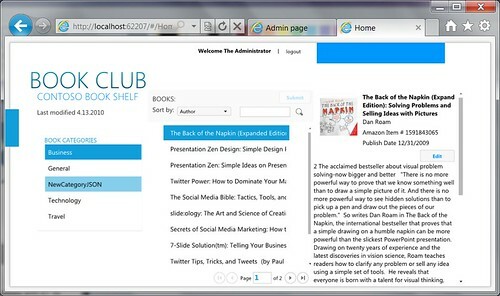 We will then see how to display all our books in a very dynamic way thanks to the Galleriffic plug-in, by using some glitch of CSS3 and the <canvas> tag. At last, we’ll see as usual how to add or remove an item after being properly authenticated. The approach we will use here works whatever the web technologies behind: PHP, ASP.NET, JSP, etc. 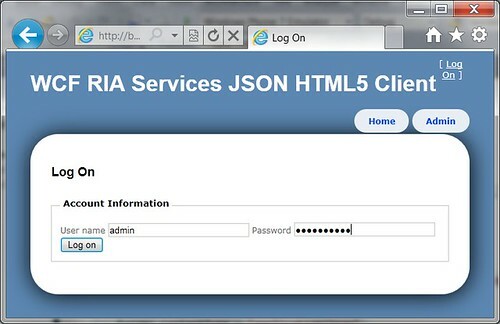 as we’re creating a HTML5 application based on jQuery running exclusively on the client side in the browser. The idea is to send some requests on the URLs where our entities’ methods live and parse the returned JSON stream. I’m using some of the new features of CSS3 like the “border radius” (to have rounded corners) or the “box shadow” (to have drop shadows) but the page still renders correctly under IE8 with just some of the effects disabled. This application works fine in all recent modern browsers supporting part of the CSS3 specifications (like IE9, Chrome, Firefox, Opera or Safari) as well as the <canvas> tag. However, you can still test this page on older browsers that will just prevent you from seeing the new effects. To my point of view, this is something very important. We can start to use some of the new features that come with HTML5 and the associated technologies (CSS3, SVG) but by taking care of not using too instable or experimental parts. If so, you’re taking the risk of being dependent of a particular implementation/browser version and you will have to review your code frequently, during each new browser update. This is for instance the case when you’re using today most of the prefixed extensions like –webkit, –moz, –ms, –o, etc. To have a better idea on the Microsoft official position on this topic, you can read this excellent blog post: HTML5, Site-Ready and Experimental on the IE blog. Indeed, I’d like to remind you that HTML5 is far from being ready to be entirely used in production for the mass market. This is simply because the specifications are not yet finished or properly tested by unit tests to guarantee a common behavior on all browsers. Moreover, after that, we will have to wait that this new class of “HTML5 browsers” takes enough market shares until the developer can use these new features in production without any stress. But it’s still fully functional! 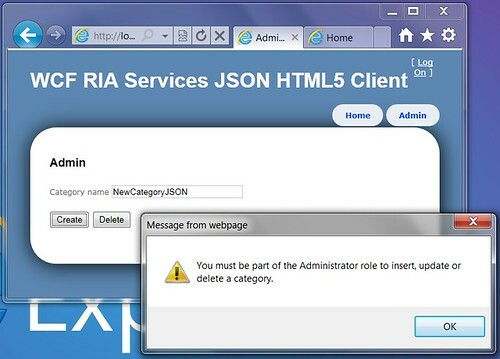 As already seen in the previous articles, you need to be authenticated and member of the “Admin” group to be able to manipulate the entities exposed by our WCF RIA Services layer in write mode. With the SOAP endpoint, in the WPF & Windows Phone 7 cases, this has required a bit of work. Indeed, we had to take care of the authentication cookie contained in the HTTP requests to send it back to the methods handling the writing operations (add, update, delete). Having an application running in the browser will help handling the cookie. We will just have to do a call to the Login() method of the DomainService in charge of the authentication logic. Once successfully logged on, the browser will send back the magic cookie for us to the calls done on the 2nd DomainService. We’re doing here a call to the Login() method available thanks to the JSON endpoint of the AuthenticationService.svc service available by default on every application based on the “Silverlight Business Application” template. If the login succeeds, we’re hiding the input controls with a fadeOut() effect and we add a welcome message to the user using its profile picture generated with the webcam via the main Silverlight application. Once logged in, we can then do some authenticated calls to the writing operations. 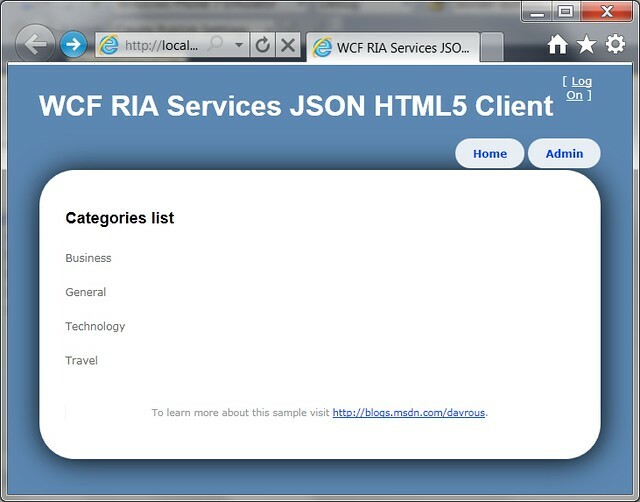 The WCF RIA Services layer will take care of checking that you’re in the proper role with the special attributes set on the methods. Silverlight is indeed able to do today what HTML5 will do (in a couple of years probably) faster, thus cheaper and with a higher quality of code. 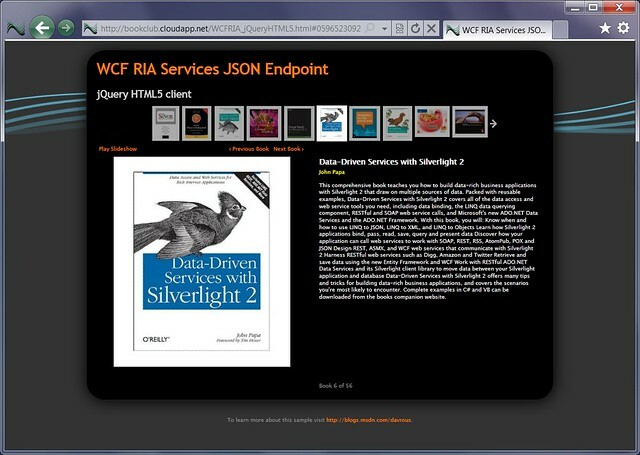 Silverlight also guarantee the same cross-browsers rendering & performance. Moreover, Silverlight offers a lot of additional features not even considered before HTML6… That goes from basic obvious things like accessing to the Webcam to the support of DRM on the video streams. If you’d like to go deeper on this subject, you can read this interesting article: Top 10 Reasons why HTML 5 is not ready to replace Silverlight . It well covers the differences between each world. And I don’t even talk about the new features we’ve announced during the PDC on Silverlight 5 supporting 3D and P/Invoke calls! Still, of course, the Silverlight plug-in remains a plug-in. It won’t be able to cover all the scenarios and all the platforms. HTML5 is then interesting and has an important potential. That’s why, it must be followed by the web developers in the next years. You mustn’t ignore it as a web developer. That’s why also Microsoft is fully committed to HTML5 by working on the specifications inside the W3C, by writing unit tests to valid them and by supporting it in a practical manner inside our next browser version: Internet Explorer 9. However, HTML5 and Silverlight aren’t enemies. They are complementary and target different scenarios. Thanks for reading. See you in the next and final article that will be dedicated to the migration of this solution into Windows Azure & SQL Azure! 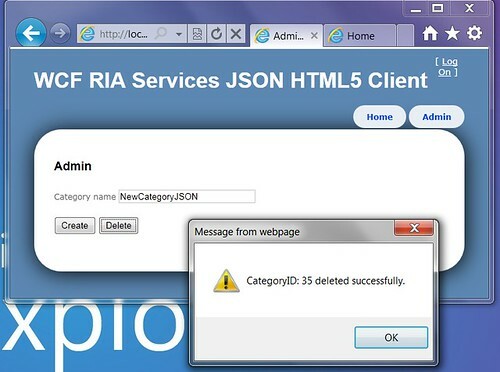 The RIA Services framework handles for you the connection between the SubmitChanges URL and the calls to each CUD methods based on the type of operations you've added in the changeset. This enables you to do several kind of changes on the clients side (create, update, delete) and launch a unique request on the server-side to ask for the complete updates. Great Article. 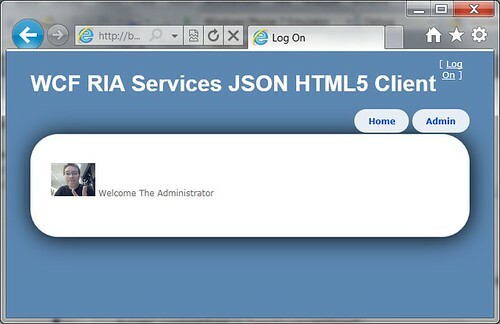 You are absolutely correct about HTML 5 vs Silverlight 5. Both are meant for unique purpose and certainly deserves their presence in industry. Thanks again for this great article. now code download link ? For along time i've seen code for this series.